Sometimes traditions don’t just fade away. Against the odds, people have again taken to hanging paper lanterns in their homes during lighting festivals. Last week, Myanmar International Television hosted a Lantern Festival celebration, featuring a lantern design contest that brought to light unsung long-serving lantern makers in Yangon, Mandalay and Mawlamyine, Mon State. Being a full-time traditional lantern maker earns a paltry income and respect but U Htein Win’s career spans 57 years and he is one of the oldest traditional lantern makers in Myanmar. A native of Mawlamyine, he is now 67. He and his 22-year-old daughter took part in the contest with a paper lantern shaped like a pumpkin. At the age of 10, he saw a man in his street making lanterns for children for fun, attracting his attention. He learnt the skills from watching him and tried to make lanterns at home, with the man’s help. In class, he hid his hands in a bag and practiced folding pieces of paper to hone his skills. In the same year, his father died. He was able to make a living as a lantern maker and he supported his study through selling lanterns. “I taught the skill to my daughter. She has a passionate interest in lantern making and is creative in design,” U Htein Win said. “Her designs are not confined by tradition. But I was disappointed to see some craftsmen copying her designs, which puts us off making new ones,” he said. A decade ago, they used to paint floral patterns on the paper lanterns, later switching to chic designs shaped like hearts, bamboo hats and pumpkins to compete with Chinese-made lanterns, taking orders from Yangon, Mandalay, Hpa-an and Taunggyi. Myanmar traditional handmade lanterns are made of bamboo and paper. But craftsmen, hand-producing a mere 10-15 a day, cannot make enough to meet demand. “There is an increased demand for paper lanterns. That’s why Chinese-made lanterns are on the market, but they are low-quality and cheaper. They can’t compete with Myanmar traditional lanterns on quality,” he said. U Htein Win said the paper lantern business looked promising. 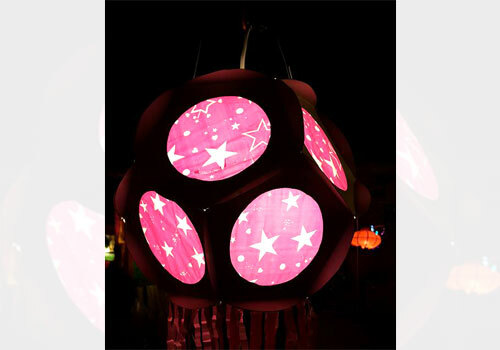 “Our products sell well, compared to Chinese-made lanterns, which are not much in demand. What we need is more craftsmen. They’re much better at design than the Thais and the Vietnamese,” he said. Bawga Street in Kyeemyindaing township used to be known as Lantern Street, at a time when it boasted more than 20 lantern businesses. Now there are only four. “Craftsmen in my street used to make rough-cut lanterns six months ahead of the lighting festivals. They would build storerooms for unfinished lanterns and added the finishing touches two months before the festivals,” said Ma Ei Ei Phyu, daughter of U Phyu Lay, whose career as a lantern maker spans 40 years in Yangon. She said when Chinese lanterns were driving the traditional variety out of the market, though that trend might have started to reverse as supermarkets order more products. “But they do the design and choose the colours, and I have to produce to their order. I have no choice to create our own,” she said.